The Top 15 Historical Sites in Nebraska! There’s much more to Nebraska than just acres of farmland. Nebraska’s rich history has been well-preserved for visitors at the many historical sites located across the state. So, take a step back in time to the days when courageous land seekers and immigrants who ventured across the country on the Oregon, California, and Mormon Trails, and learn about the role Nebraska played in the history of our country. Here are the top 15 historical sites to visit in Nebraska. Designed by New York architect Bertram Grosvenor Goodhue in 1920, the capitol building was completed in 1932 and remains one of the tallest buildings in Lincoln. It is often known as the “Tower on the Plains” and can be seen as far away as 30 miles. The structure houses the offices of the Governor of Nebraska, the Nebraska Supreme Court, the Nebraska Court of Appeals, and the Nebraska Legislature. The original home of J. Sterling Morton, the founder of Arbor Day, sits on a beautiful estate in Nebraska City. The mansion has 52 rooms and is furnished with authentic artifacts that capture the times and life of this famous Nebraskan. The Arbor Lodge State Historical Park encompasses more than 65 acres and the grounds and mansion were donated to the state in 1923 by Morton’s oldest son for preservation. For over 90 years, Nebraska football teams have called Memorial Stadium home. This historic stadium can hold more people than any Nebraska city except Omaha and Lincoln and is often referred to the “Sea of Red” on game days. The Homestead National Monument of America was developed in 1936 to commemorate one of the first documented homesteads in Nebraska. It acts as a tribute to the courageous land seekers and immigrants who ventured across the country in the late 19th century with the promise of Free Land thanks to the Homestead Act of 1862. 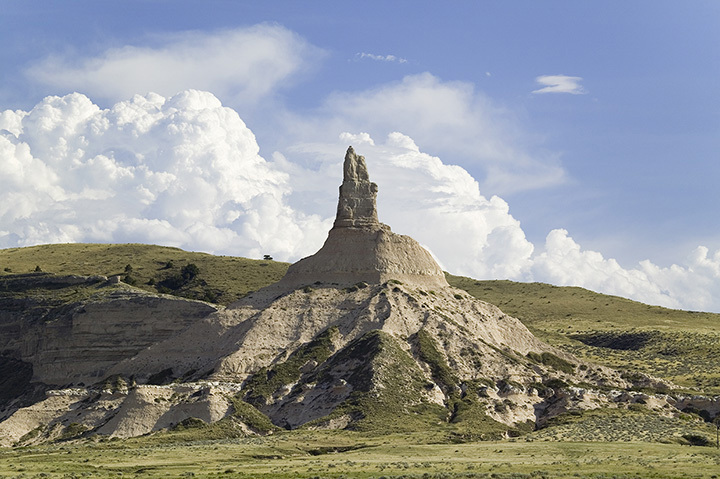 This dramatic landmark rises 480 feet above the surrounding plains and once acted as a reference point for pioneers heading westward in the early to mid-19th century. Today, visitors can get a sense of what the pioneers felt and saw as they crossed this part of the country at the Chimney Rock visitor center. In 1917, Father Flanagan, the founder and visionary of Boys Town, opened his first Boys’ Home in an old Victorian mansion in downtown Omaha. He helped children both nationally and internationally and the property was listed on the National Register of Historic Places in 1985. Located near Lewellen, the Ash Hollow State Historical Park served as a campsite for emigrants on the Oregon, California, and Mormon Trails. The site provided pure drinking water, wood, and grass for the stock. Today, the park features a schoolhouse, ancient cave, museum, and visitor center with spectacular views of the North Platte River valley. William Jennings Bryan served two terms in Congress and was U.S. Secretary of State and the Democratic nominee for President in 1896, 1900, and 1908. His historic residence, also known as Fairview, has been restored and now features the public Bryan Museum. This historic Missouri River dredge boat was launched by the U.S. Army Corps of Engineers in 1931 and serves as one of the few surviving examples of vessels built to control flooding and improve river navigation. The site was listed as a National Historic Landmark in 1989. Red Cloud, Nebraska was the childhood home of Willa Cather, a Pulitzer Prize-winning author, and the backdrop for her numerous novels and short stories about Nebraska. The home located in Red Cloud is now one of the most important Nebraska buildings associated with her literary career. Fort Atkinson played an important role in the Western expansion and the fur trade. The fort is famously known as the site of the council between the Lewis and Clark Expedition and the Otoe-Missouri tribe. The post has also been credited as the first town in Nebraska. Many historic events during the final decades of the Sioux and Cheyenne River resistance occurred at these two sites along the White River. Built in 1874, the fort was designed to protect the Red Cloud Agency, an Indian agency for the Oglala Lakota, Northern Cheyenne, and Arapaho. Today, the Fort Robinson Museum features many exhibits on the fort’s history and historic buildings for viewing. The only Admiral Class Minesweeper left on the planet, the USS Hazard is situated in Freedom Park in Omaha, Nebraska. The minesweeper’s purpose was to aid and protect large naval vessels from the Japanese during World War II. The park also features the only complete collection of USN anti-aircraft guns. Senator George W. Norris made his home in McCook, Nebraska, from 1899 to 1944. He represented Nebraska for almost 40 years in the U.S. Congress and served 10 years in the House of Representatives. Now, visitors can learn about his life in his beautifully preserved home which has been designated a State and National Historic Site. Located on the Omaha Indian Reservation, Dr. Susan Picotte Memorial Hospital was established by Dr. Susan LaFlesche Picotte, the first female Native American medical doctor. The building worked as a functioning hospital from 1912 until the late 1940s and was declared a National Historic Landmark in 1993. View more Nebraska Historical Sites.